Enjoy this beautiful, relaxing 4-bedroom home located in the Boulder Mountain Highlands of Mesa - gateway to state parks and the Tonto National Forest. Fantastic access to scenic views and ALL outdoor activities. All furnishing are BRAND NEW as of October 2015! Furnished to the tee, all details considered. Located on a quiet cul-de-sac in a private, gated neighborhood this spotless home offers a heated pool with many resident birds, especially hummingbirds. Home offers 4 bedrooms including a king master suite that features double sinks, shower and walk-in closet. Additionally, three queen-bed bedrooms offer complete guest comfort. Full bath exclusive to the three-bedrooms, additional half-bath on the main floor. Relax with a good book or a device for some quiet time in the formal living room while others enjoy a movie or games in the separate family room fully complete with leather furniture and a 70” TV. Kitchen to Family Room offers an open concept floor plan so even the cook can watch football or baseball with the group! Beautiful kitchen with a combination of stainless steel/black appliances, nice counter space and island for food prep. Tall top kitchen dining table that seats 4 and overlooks outdoor grass yard, pool, patio table and BBQ grill. A separate formal dining room features a tall top dining table that seat 6. The sunny weather affords the opportunity to enjoy the heated pool, lounge chairs, grass yard and outdoor entertaining area year round. Full size washer and dryer. 2-car garage. Please note that the HOA does not permit street parking. Your vehicle must fit into the garage or driveway. (Most cars and pick-up trucks do fit.) No large truck, trailer or RV parking. Conveniently located close to highways 202 and 60. Sky harbor airport (25 miles), Phoenix-Mesa Gateway Airport (14 miles) downtown Phoenix (30 miles) Scottsdale's premier shopping (24 miles) Dana Park Village Square Shopping Mall (12 miles) Superstition Springs Shopping Center (8 miles). Keywords: Clean, private, green belt, cactus, lake, hiking, state park, bike, horse, range, boating, rafting, tubing, relaxing, rest, neighborhood, quiet, cul-de-sac, pool. 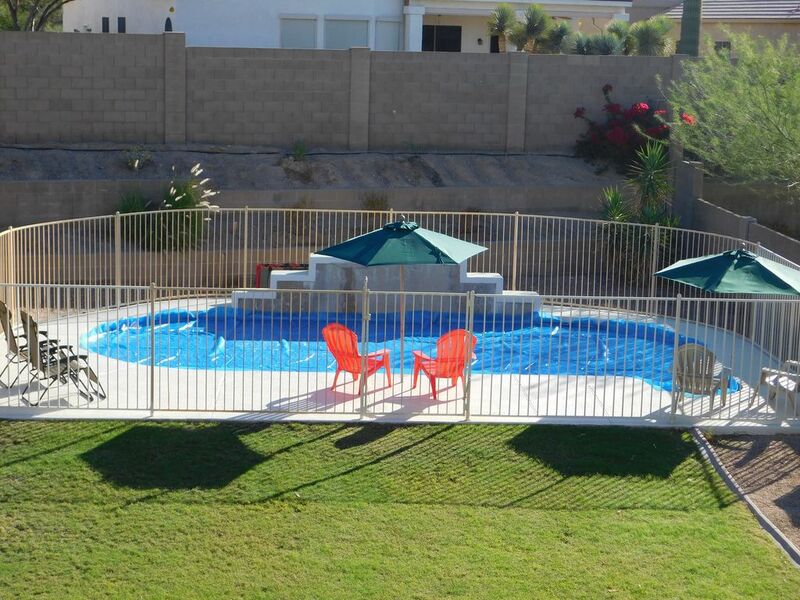 Gated Community located in beautiful northeast Mesa, Gorgeous mountaintop views, Just a short drive to great shopping, beautiful golf courses, fantastic restaurants, mountain hiking and biking, boating and sightseeing, highway 202 Loop, Sky Harbor International Airport, Phoenix Mesa Gateway Airport. Downtown Phoenix and Scottsdale. Beautiful Saguaro Lake is only 20 minutes away through beautiful desert landscape. They offer a boat launch, restaurant and picnic areas. Rent a boat or take a cruise on their tour boat at the marina, Drive to Phoenix for museums or shopping or lay by the pool and enjoy the quiet and beauty of the desert. Large yard with heated swimming pool, backyard patio with gas grill and furniture. Newly furnished 4 bedroom home with sitting room, dining area, fully stocked kitchen, family room with HD TV. Spring Training baseball, the Cubs, that is what started it all! We fell in love with the Mesa area. From Montana, looking forward to retirement, we started 'the plan' and it included purchasing this beautiful home near the mountains in AZ. We need a home this large to welcome our 3 adult children and 10 grandchildren on occasion. We are delighted to share our home with vacationers until we are able to use it more often. toilet, combination tub/shower, Double sinks, hair dryer too! toilet, tub, shower, Double sinks, hair dryer too! No Land-line, Cell phone booster in use, good reception. Two sets of bed sheets per bedroom. Tan for the Master, Slate Grey for second full bath. White towels for the pool. Full size couch, Love Seat and Chair and half. Separate Family room furnished with Leather Recliner chair, Recliner Couch and Side chair with ottoman. Side by side, stainless steel. Ice maker and filtered water on the door. Fire Stick in Living room, Roku in Master bedroom. Many courses available, 4 sets of golf clubs available. Deck Chairs and umbrellas, pool toys too! Heated pool with solar cover (winter), easily removed with reel. Thanks, we are glad it all worked out for you. We spent ten days at this lovely home while visiting Mesa to celebrate a wedding. It was extremely well organized with all of our needs met. The sheets were soft, towels fluffy, and the beds were cozy. The master bathroom was spacious as well as gorgeous. This home was very tastefully decorated and the furnishings both beautiful and comfortable. We were able to spend a few afternoons on the delightful porch watching the hummingbirds, quail, and dove. The kitchen was very well equipped and organized. This home provided us with the opportunity to rest and unwind from our hectic wedding schedule and spend quality time with family. We are hoping to visit again someday and will plan to take time to explore the walking trails in the area. Thank you so much. It makes us happy to know that your family vacation time at the Mesa home was enjoyable. Those hummingbirds are a sight to see, we agree. You are welcome back anytime. Thank you so much. This is our third time staying at the property and it's been a nice experience every time. We look forward to booking again next year! Thanks Mari, you're welcome anytime the house is available. Happy Holidays, Jim and Jan.
House, location area and owners were awesome. Said there nearly 5 months and could not have asked for anything more. This home worked great for our family. It was clean and comfortable. The beds were great, neighborhood was safe and quiet, and it had everything we needed to enjoy our time in Mesa. Your kind words are much appreciated. We are delighted to know your family time together was enjoyable. Comfortable, with everything you'll need/want! Our group stayed here in March 2018 for a week. 4 adults, 3 children and 1 baby. The house is very spacious and comfortable. There was definitely enough space for a group our size. The master walk-in closet made a perfect "bedroom" for the baby. The house had everything we needed, down to a pack-n-play, high chair, basket full of toys for the kids, DVDs, a cheese grater and all the little things you need for cooking. The bathrooms were all stocked with lots of towels and shampoo (Pantene), etc. The bedrooms were private and very sound-proofed, you couldn't hear anything from the other bedrooms. The washer and dryer fit huge loads of laundry! The owners were very quick to respond and very helpful!!! They provided us with all the information in a nice package, and everything in the house is labelled. The thought and organization that they put into this rental process is really appreciated, made it very easy. The house is such a nice neighborhood (gated), with a lovely playground in walking distance. Also near the playground (and just off the school parking lot) is a beautiful walking trail with little "stations" for kids along the way (dig for dinosaurs, telescope, etc). We really enjoyed it! The house isn't very close to many "amenities" like if you wanted to run for a quick coffee. You do have to drive 10+ minutes to get to a grocery store, etc. A new complex has been built, sort of near by (Basha's, which has a Starbucks inside, is already open). But I think you still have to drive to get there. The pool has a sturdy fence around it with a gate to enter, which was important to us with little ones. If I remember correctly, it was about a 30-40 min drive from Sky Harbour airport. We would definitely stay here again! It is heart warming to know your family enjoyed the Mesa Home. Sounds like it was a good match for you all, the house, the yard, and the neighborhood. Thanks for doing a couple of "home owner" chores, much appreciated! Cancellation must be 60-days prior to booking appointment for the first payment refund. Heating pool is $50/week during winter months. Tax rate is based on length of stay; 30+ days 2% - less than 30 days 14.27%.